I’ve often been asked, “Can you share with me your success formula?” I’m always at a loss of words. Back in school days, one of my favourite subjects was mathematics. I find formulas & mathematical applications fascinated. How we can group things together and use an identified way to solve those similar problems that appear over and over again. You have a math problem? Here’s the formula to use! A ready answer for any similar challenge. Imagine having a cookie cutter to mould the dough into a desired shape at one go. It saves time and produces the perfect result! When I was young, before any test or examinations that required any form of mathematical calculations, my classmates would come along with an A4 formula cheat sheet for a final memory refresh. It’s like arming themselves with “ammunition” before the “battle”. Fast forward to today, I observe a demand for formulated success plans. Often, these “tips” or prescribed formulas doesn’t seem to work as well as originally promoted. It’s puzzling. Does such a blueprint for success actually exists? Heard of “magical” learning formulas others to apply in your personal lives, career and businesses for instant success? That’s rubbish. They don’t work. First of all, instant successes do NOT exist. If they did, all of us would have achieved them by now. Firstly, we are biologically hardwired to look for shortcuts. A study by the University of College London shows, we are more inclined to take the path of least resistance. Conversely, when something is too difficult to achieve, our brain tricks us into believing that’s the wrong option. That’s why humans constantly innovate and evolve. We invent things to make our life easier, to save time so we can be more effective in our day to day tasks and use the “saved time” to do more or do other activities in a day. For example, before the washing machine was invented, we had to handwash our clothes. That takes up alot of time and effort especially if you have many family members. With the invention, we can take a break or do something else while the clothes are in the machine. In the past, if you have a big family, you need to wash a huge load of dishes after each meal. When the dishwasher came about, this reduced the amount of “manual labour” and released the time for an post-dinner activity instead. Secondly, we all know time is our only “unrefillable” asset. Once time has passed, it’s gone forever. Because we are aware of the limited time in our life, we want to succeed quickly when we are “young”. There is a Chinese idiom “一步登天” (yī bù dēng tiān). Literally, it means reaching heaven in a single step. It’s a negative expression that used to describe someone who expects instantaneous success. Our common “identity” as human beings assumes that what works for someone else will also work for us! That’s a myth. We forget, even though we might have similar physical characteristics, our emotional characteristics are different! Our origins and values differs. Our innate potential and gifts could also give some of us a headstart in life. For instance, someone who has a “picture perfect” memory could memorize facts more easily. And what happens to us in our lifetime changes and affects our personality and character over time. These are variables that have been overlooked in our pursuit of success. I used to research success formulas and then”copy” and “paste” them into my life. After a number of failed attempts, I realized other peoples’ formulas do not work for me. And I came to another conclusion: Neither does it work for anyone else. There is NO one pre-written formula for everyone. Let’s try to approach this from a mathematical angle. You can replicate someone else’s success if and only if your every single variable mirrors someone else’s. We all know, formulas work only WHEN we possess the value of every variable. Because the exact values of each of those variables are non-identical, even if you are going down the route of well-treaded path, your journey would still be uniquely yours. It’s human nature to look for shortcuts. Even I have fallen into this trap. I invested alot of time applying other people’s formulas to my own life. I’ve been advised that those formulae worked for others, so they should work for me too! Well, they didn’t work. Not in the way I expected and imagined. One day, it struck me that I needed to carve my own success. Eight years ago, I quitted my job in Singapore and arrived in London without a job. I had no proper work visa. After customizing and sending over 100 resumes to recruiters and employers, I finally secured a job after four months of job search. Six years later, I left my 9–5 job to strike out on my own. Till now. There were no formulas to apply when I needed one. What I trusted was my gut. And I persevered with my dreams. Ultimately, I was determined to make things work. My recommendation to you, ditch other people’s formulas. Begin authoring your own personal success formula. Go ahead to reference other formulas but ultimately adjust them to fit your unique self. If you have been thinking of giving up, check out my other articles on how to give your dreams a second chance and the most vital part of success nobody ever talks about. 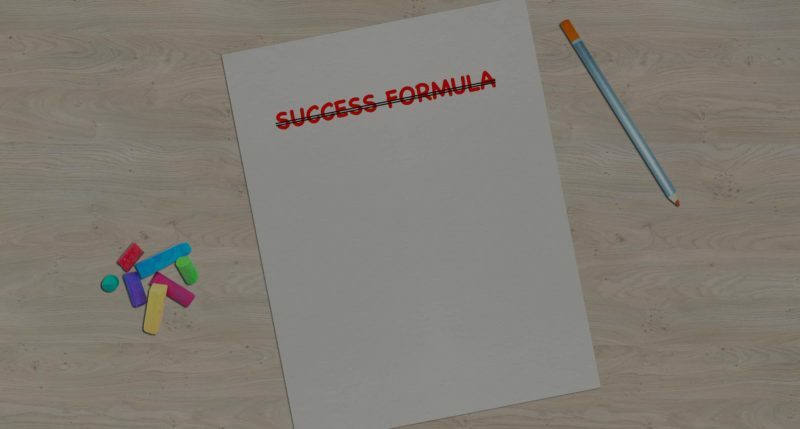 How do you determine your personal success formula? ***This article is also published on MAQTOOB.